Pardon the pun, but zombies have been done to death. In comic books, in films, on TV and certainly in video games. Yet developer Techland, creator of 2011's ambitious yet flawed Dead Island, has decided to take another crack at the virtual zombie apocalypse with Dying Light. The big difference this time is that the game relies heavily on parkour for movement, lending the otherwise brutally violent zombie apocalypse a speed and freedom not often seen in the genre. By itself, this one new element isn't enough to elevate Dying Light above the hordes of similarly themed games, but if the developer could seamlessly attach parkour to some of the better ideas found in Dead Island while polishing that game's poor design decisions, Dying Light has a lot of potential. Dying Light never fully lives up to this potential, but in the attempt, Techland offers an impressive twist on both first-person action games and life among the walking dead. Dying Light takes place in the city of Harran, a fictional amalgam of numerous Middle Eastern locations. Immediately prior to the game, Harran was hosting a massive international sporting event when a mysterious illness broke out and started turning people into the ravenous walking dead. You are cast as Crane, a secret agent dropped into Harran after the outbreak for reasons I won't spoil here. Needless to say, Crane wants nothing to do with the region's hungry corpses and he has two good options to that end: He's a parkour prodigy capable of climbing nearly anything and surviving falls of immense height, and he's willing to run endless, nigh-repetitive fetch quests for Harran's citizens. These are lucky breaks for Crane, as he can't go toe to toe with zombies for long. Though his foes are largely of the slow, dumb, classically Romero-esque variety, they have a tendency to swarm and appear out of nowhere, gradually cutting off viable escape routes. If you attempt to club one to death, you will eventually succeed, but the bloated bodies take a lot of damage before falling apart, unlike the weapons Crane finds and crafts throughout the game. Implements of destruction aren't as annoyingly fragile as they were in Dead Island, but still ensure that players must constantly monitor the state of their favorite knife, shovel or electric cricket bat. The core of Dying Light is parkour, but in a more general, correct sense, it's movement. Everything, from the control scheme to the various visual effects it utilizes, are aimed at creating a realistic, natural sense of human motion. For the most part, it succeeds. Despite the first-person viewpoint, jumping, running and scampering throughout the city of Harran is easy and rapidly accessible. Your character's body has a palpable inertia that operates not quite realistically, but under its own intuitive, easily-grasped set of physics. The sensation is not unlike the fluidity of motion seen in the similarly parkour-focused Mirror's Edge, only Techland has designed a more interactive world than we've seen in any previous game that relied on free running for navigation. At least, to a point. You'll marvel at how many things you can climb on, jump off of and shimmy over, but there are a few glaring moments where the fiction of being a parkour wizard is shattered. Why is it that I can scale a hundred-foot communications tower by leaping and clinging like a lemur, yet I can't climb a chainlink fence one-fifth that height? Still, these annoyances are the exception, rather than the rule, and for the most part Dying Light offers a freedom of movement that's unparalleled in first-person action games. Not just a useful method of escape when the zombies surround you, parkour also serves as the best way to traverse Harran. As in Dead Island, most of the single-player campaign consists of fetch quests requiring that players sprint across the map and either talk to some random person, flip a switch or gather supplies. The world design and fun of leaping across buildings keeps the otherwise repetitive tasks from getting stale, which is good, because the vast majority of a player's time in Dying Light will be spent running back and forth between contacts spread throughout the world, dropping off items or completing quests, and hoping to earn enough experience to unlock another rung on one of the game's three skill trees. It's baffling to hear that Techland once planned the Be The Zombie multiplayer mode exclusively as a pre-order bonus (it's now free DLC), because it's one of the game's more exciting aspects. In lieu of the typical team-based shooter gameplay or straight up, one-on-one fights, Dying Light features asymmetrical multiplayer that casts one player as a super-powered, hyper-agile zombie who then stalks up to four other players cast as frail humans. Ostensibly, the humans are trying to smash zombie nests, but mostly they're just trying to survive while the zombie flits around like Batman on tendrils that serve as grappling hooks. The zombie can pounce from a dozen yards away for a nearly-guaranteed kill, or he can stay back, spit some goo at the humans and watch as a horde of his otherwise sedate zombie pals go berserk and tear the nearby living to bits. The sense of scrambling, frantic helplessness as a human being stalked by one of these creatures is right up there with the best survival horror moments. It's only eclipsed by the feeling of freedom and overwhelming power you get by playing as the souped-up zombie and wrecking humans for yourself. The highlight of the Be The Zombie mode is its asymmetrical nature. 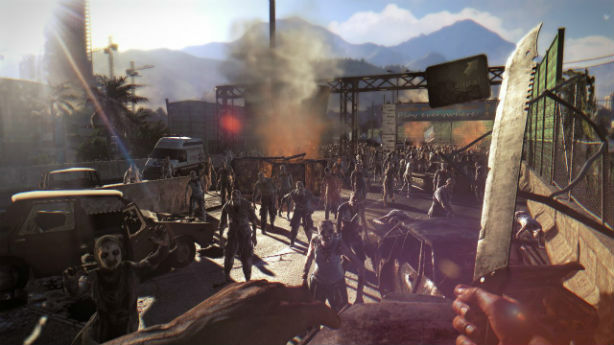 Players are able to invade other people's games as a super zombie at will, but during the campaign, Dying Light offers the option to turn off these invasions or restrict them to certain times of day. Much as I enjoy it, this mode and the invaders it brings with it won't appeal to those playing Dying Light strictly for its single-player world, and it's thoughtful of Techland to make the feature optional. If you're coming into this parkour-zombie fusion hoping for an oppressive sense of horror, you're going to be pleased with Techland's obvious affinity for the staples of the hungry corpse genre. Gore is plentiful and (often approaches truly horrific levels), human characters are almost always worse than the zombies, and Harran itself seems to spawn the kind of scenes you'd expect from an 80s-era George Romero film. My favorite example of these spontaneous set pieces came when I stumbled upon two unaware bandits standing over a corpse. I was on a bridge high above them, and instead of making my way carefully down the nearby embankment I decided to jump, correctly guessing that it would be the more awesome option. Naturally, I aimed directly for the head of the nearest bandit. Not only did this break my fall and prevent my character from taking damage, but it also dropped the bandit whose body collapsed with a satisfying crunch and flourish of ragdoll physics beneath my feet. Stunned from the trauma of having an angry man land on his noggin, the bloodied bandit quickly succumbed to a rain of blows from a tricked-out police baton. His buddy, who had spent the entire beating glancing around in terror, sees the explosion of blood that was once his friend, and runs screaming, headlong into a pack of zombies. They ate him. It was an absurdly violent yet comedic moment that both proves the versatility of the world Techland has built and demonstrates the kind of pitch black humor found in all the best zombie fiction. For all the fun I've had leaping over zombies and off of rooftops over the past few days, the most impressive aspect of Dying Light is what it says about developer Techland. The studio's previous attempt at an open-world zombie survival game featured an ambitious scope and demonstrated a fondness for the genre, but was pocked with glitches and design decisions that are well-intentioned but ultimately not fun. With Dying Light, however, Techland has both improved on its previous efforts and learned to play to its strengths as a developer. The result is a take on zombie fiction that could benefit from a bit more polish, but is otherwise a grand excuse to once again tour the apocalypse. Dying Light is dodgy at times and begins to border on repetitive around the halfway point, but it offers something rarely seen in the ubiquitous zombie apocalypse subgenre: novelty. Running, jumping and climbing around its impressively-detailed city while zombies chase you, with jerry-rigged weaponry and first-person fisticuffs as your only defense, is both tense and rewarding. Meanwhile, copious gore (that's rendered in almost pornographic detail) and pitch black humor maintain the frantic, fatalist tone of classic zombie fiction. Ultimately, Dying Light may not be perfect, but the parts that work are so satisfying that they overshadow the rough patches. This review is based on the PlayStation 4 version of Dying Light, provided by Warner Bros. Images: Warner Bros.